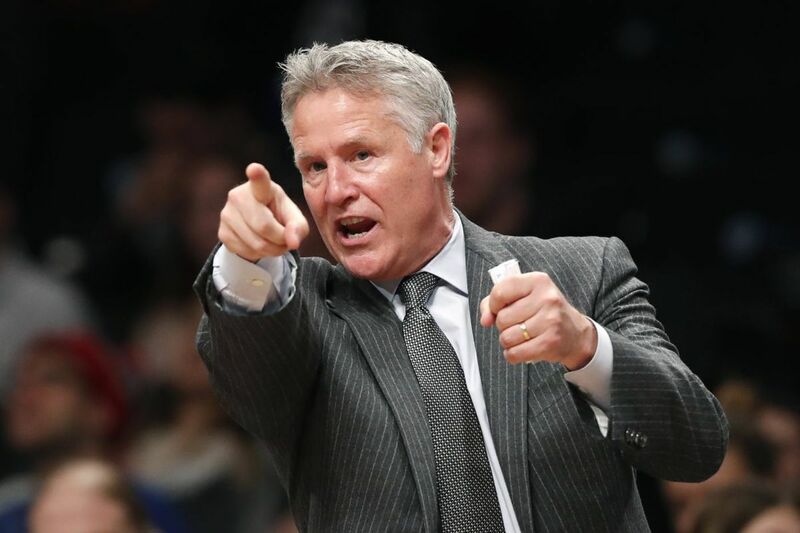 Sixers coach Brett Brown gestures during his team’s victory over the Nets. This is far from a must-win game for the 76ers, but it could be a barometer. The Sixers' struggles against teams battling for playoff position have come on the road. So they won't learn whether they've overcome that problem when they play the Indiana Pacers on Tuesday night at the Wells Fargo Center. But the game is huge, nonetheless. Indiana boasts the Eastern Conference's third-best record, 39-28. The Pacers also have won five of their last six games. Something will have to give, as the sixth-place Sixers (36-29) have won 13 straight at home. But they preach that no game is bigger than any other. So Sixers coach Brett Brown won't hype this game publicly. Straight out of Coachspeak 101, he'll say only that the focus is on showing improvement. And they showed that they have plenty to work on in recent road losses to playoff contenders Miami (Thursday and Feb 27), Milwaukee (March 4), and Washington (Feb. 25). "You feel what Miami exposes," Brown said after Sunday's 120-97 road victory over the Brooklyn Nets. "You feel what Washington exposes. You felt what Milwaukee exposes. And we are going to feel a very hot team in Indiana." Brown said he learned from losing to those three teams that the Sixers have to be able "to play longer" at a high level. The coach said he felt the pain of having a team with young cornerstones experiencing ups and downs in those contests. "I'm hoping that we can arrest those types of mood swings," he said. He also said "our bench is coming along," citing the play Sunday night of T.J. McConnell, Ersan Ilyasova, Marco Belinelli, and Richaun Holmes. "I was really happy with that part of the evolution," he said. "But I think the road [games] sort of teaches you those types of things." The Sixers' bench had been a huge weakness before Sunday. The subs had a tough time holding onto leads and containing opposing scoring threats off the bench. While they played better Sunday, it's hard to gauge if the subs improved or the Nets are just that bad. They'll definitely find out Tuesday. The Sixers will look to do a better job of defending Pacers reserve guard Lance Stephenson. He had a fourth-quarter outburst in a 100-92 victory over the Sixers on Feb. 3 at Bankers Life Fieldhouse, scoring 12 of his 14 points in the period. Stephenson scored or assisted on the first 15 points of the quarter for Indiana. This will also mark the Sixers' first game against Trevor Booker since waiving him on Feb. 28 to make room for Ilyasova, whom they signed after his contract was bought out by Atlanta.